The great test for me to determine if a cinematic adaptation works is going to see a movie while being superficially knowledgeable about the source material. I have never read the Stieg Larrson Trilogy about Lisbeth Salander nor have I seen the Swedish movie adaptations starring Noomi Rapace. I did see David Fincher’s Oscar-nominated English language version of THE GIRL WITH THE DRAGON TATTOO and was very impressed and was looking forward to the Sequels that would once again feature Rooney Mara in the lead role, but those never materialized. I then was super excited to see the character return in a new reincarnation adapted from the fourth book in the Salander Saga, written by David Lagercrantz as Larrson passed away over ten years ago. In THE GIRL IN THE SPIDER’S WEB, Claire Foy takes over the lead role and is quickly identified as an avenging force of nature as she strings-up a violent, sexual predator of a husband, all the while using her innate technological savvy to transfer all his money into his wife’s bank account. Lisbeth is elaborately-garbed, looking a like a “Goth” Marvel superhero. We also learn how, as a young girl, she daringly escaped the clutches of her incestuous father leaving behind her slightly older sister, now presumed dead. These sexually-charged opening scenes segue into a movie that is more Thriller than anything more exotic. In fact, there is a James Bond-meets-Mission Impossible vibe to THE GIRL IN THE SPIDER’S WEB where I wasn’t really expecting it to go. The Plot revolves around Salander being asked by Frans Balder, a former NSA agent (played nicely against type by the usually-funny Stephen Merchant) to ensure that a software he created not fall into the wrong hands as he and his Autistic-savant son are being pursued by a Russian gang called the Spiders and an American operative (the compelling Lakeith Stanfield). Throw in investigative journalist Mikael Blomkvist (Sverrir Gudnason, seen in BORG/MCENROE) into the midst and we have a roller coaster ride of explosions, thrilling car chases, technological gadgets, shootings, double crossings and surprises. THE GIRL IN THE SPIDER’S WEB never bores, even if some of the stunts appear to be too outlandish for credibility. The wintry Swedish landscape beautifully parallels the coldness in which Lisbeth leads her life, professionally and personally. Claire Foy gives a standout and enthralling performance. She is a chameleon, almost making you forget this is the same Actress who portrays Queen Elizabeth ll in The Crown and Neil Armstrong’s wife in FIRST MAN. What is missing in her performance, through no fault of her own, is the cyberpunk, queer edge that would have made this all the more absorbing. It is a little sad to see Lisbeth Salander de-fanged. I am also a huge fan of Lakeith Stansfield, although he is under-utilized. However, I was impressed with young Christopher Convery in the role as Frans Balder’s son as he made an impression with minimal screen time. 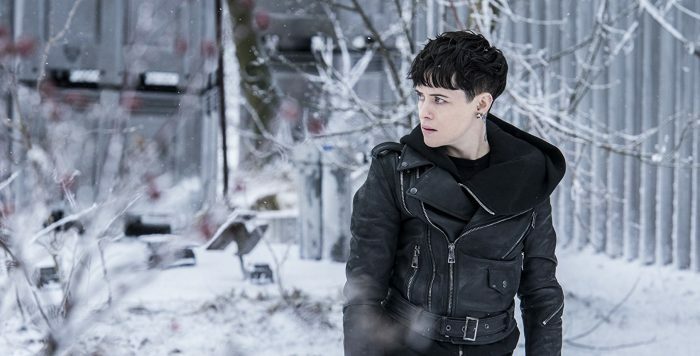 The audaciousness the Series is known for may be lacking, but THE GIRL IN THE SPIDER’S WEB is still a highly-charged, captivating Thriller that should be judged for what it is and not for what we would have liked it to be. Sony Pictures Canada release THE GIRL IN THE SPIDER’S WEB Friday, November 9, 2018.